In Ashford, where I work, the sun had peeked out from behind some dense clouds and things were looking promising. Little did I know that 20 miles away in Dover things weren’t shaping up quite so nicely. On the journey from Ashford back to Folkestone, things began to look a little grey. Ever the optomist, I reminded myself of the weather forecast I had seen of radiant sunshine from 5pm until sunset in Dover. Surely these clouds were just hanging over Folkestone and when we arrived we would find Dover bathed in the warm glow of the evening sun. We quickly packed up our cooler, complete with Sicilian lemonade, Italian picnic sandwich and mozzarella and pesto chips to keep with the Italian theme that had somehow taken hold of our outing, grabbed our folding chairs and were out the door. Had we stopped to remember that this was England, land of ever changeable and disappointing weather, we might have brought a blanket or two and my husband may have decided on something heavier than a summer jacket. But in our excitement, and our rush to catch the train, we left with full belief in the meteorologists at the BBC. As we stepped off the train in Dover, our hopes were dashed by the darkening sky and biting wind. The taxi driver regaled us with the story of the afternoon, sunny and glorious until 5pm when the clouds started rolling in. We arrived at the castle where they were selling picnic rugs, which were doubling as throws, and immediately donned our jackets, set up our chairs and watched as the fog rolled in. Had it not been for this picnic sandwich, and the fantastic efforts of the Changeling Theatre group, we probably would have gone home in a huff and watched some crappy TV. 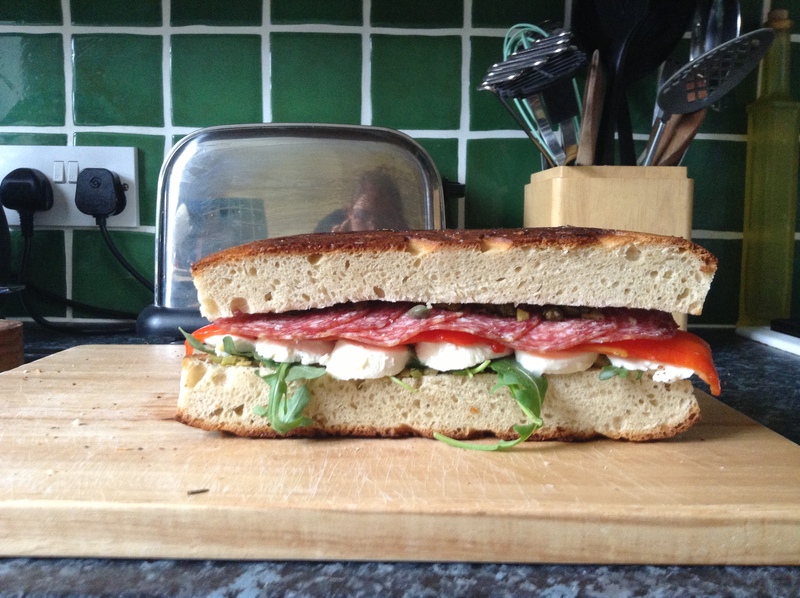 This sandwich though: peppery rocket, creamy mozzarella, sweet and sour roasted peppers, salty salami and zingy olive, caper and gherkin salad all enveloped in soft, spongy, olive oil-rich home made focaccia. That would lift anyone’s spirits, wouldn’t it? 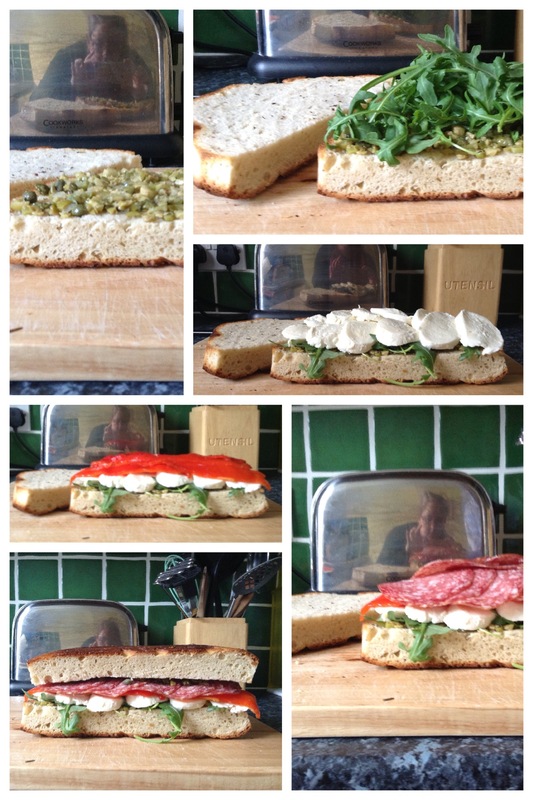 Using a whole loaf of focaccia, this sandwich will feed eight and it is quite substantial as you can probably see from the photos. As this was a weekday, I had to bake the bread the night before, but I waited until we were on our way out the door to assemble the sandwich*. You’re supposed to let it sit together for an hour, but much longer than that and I think the bread would go too soggy − and I was proved right the next day when we had the leftover slices for lunch, luckily the bread was thick enough that I could remove the soggy bits and was still left with enough bread to hold the sandwich together. So maybe you’re thinking of making hay while the sun shines and if you are going on a picnic, just make this sandwich. I’ll promise you’ll be glad you did. *Recipe in Olive magazine July 2013. Great sandwich, but that is one beautiful bread! 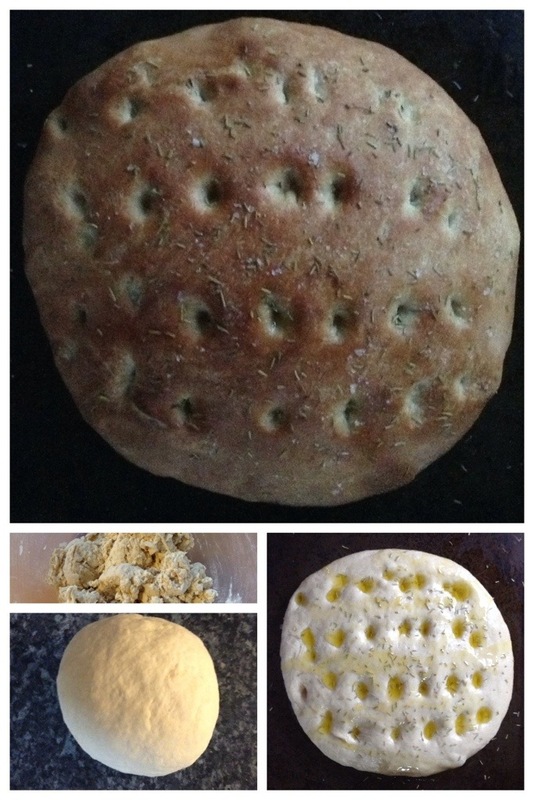 It was my first focaccia and I must say it was very exciting! Fixed it now! For some reason it published as if it was July 3 instead of the 6th, so when I changed the date the link changed which is why it wasn’t working from Facebook or Twitter or probably from email alerts either! Boo technology! Now, that’s how a sandwich should look. Beautiful bread! Thanks! I was proud of it! What beautiful sandwich! Too bad the weather didn’t cooperate during your outing! It was beautiful today, so that’s something. That sandwich looks fabulous, but you had me with that focaccia! Thanks! I think all this praise calls for more bread making!